Fraternity and sorority life has been a significant part of the undergraduate experience at Rochester since the founding of the institution. The University’s continuing commitment to these diverse groups stems from the significant opportunities they provide for intellectual, cultural and interpersonal growth—opportunities that complement the College’s formal academic program. Within this framework, the College will continue to foster and support inter/national fraternities and sororities. Because we recognize that self-governance fosters the development of personal and group responsibility and maturity, the College expects and encourages fraternity and sorority chapters to operate with as much independence as their performance warrants. This self-governance should include expression in a democratic system where ideas and opinions are discussed freely, and where many persons have an opportunity to lead, serve, and follow in an environment where decisions are made and accountability is acknowledged. 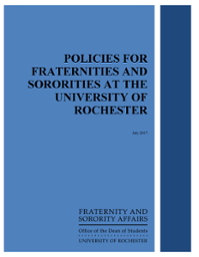 This document outlines specific policies, expectations, and unique support structures for fraternities and sororities. It is intended to provide transparency and clear communication of expectations to help our member organizations achieve success. Further description of the College’s framework of support for the fraternity and sorority community can be found within the Statement of Relationship document. The document is maintained by Fraternity and Sorority Affairs, though some policies may be within the purview of other offices/departments at the University of Rochester. Questions about these policies can be directed to John DiSarro, Director of Fraternity & Sorority Affairs, at john.disarro@rochester.edu. Individuals seeking revisions to an existing policy may request that the Management Committee review that policy through the appropriate committee representative. The policies outlined in this document do not replace or supersede other policies for students and organizations at the University of Rochester. Fraternities and sororities and their members are still subject to the Standards of Student Conduct and other policies relevant to student organizations. In the event that the policies for an inter/national organization or council differ from University of Rochester policy, the University policy will hold primacy.